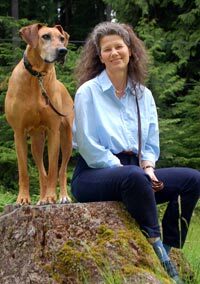 Located in Qualicum Beach, Vancouver Island, B.C., Definitely Dogs offers a holistic and enjoyable approach to modern dog training. As trainer and owner, it is definitely dogs for me, Domena Diesing! Dogs are my passion as well as my profession. My ultimate goal is to enhance the relationship between people and dogs and to help owners connect more deeply with the dogs in their life. While browsing this website, I hope you’ll learn about my services and encounter helpful ideas, interesting concepts, and useful resources. There is much knowledge available about our ‘pet’ dogs today, but it can be difficult to find and is slow to reach the average dog owner. I have devoted some of my website to offer you more information on three topics close to my heart: Puppy Primer, Challenging Dogs, and Kids & Dogs. Whether you acquired a brand-new pup or inherited a second or even third-hand dog, I can help you bring out the very best in your pet and achieve the relationship you are hoping for. I use effective and humane methods and I am committed to respecting and understanding the dog and owner alike. My greatest pleasure is to see my clients succeed with their dogs, whether it is in resolving simple training issues or significant behaviour problems. Dog training can be useful and enjoyable! It is with great commitment, encouragement, patience, skill and professional knowledge that I offer my dog training services to you. I will be pleased to help you with any questions or concerns in regard to your dog, whether by email: domena@definitelydogs.ca, telephone or in person.